A modern bistro style restaurant on the scene in the Haute Savoie! 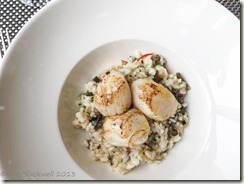 BCom Brasserie was new to the area towards the end of 2012. 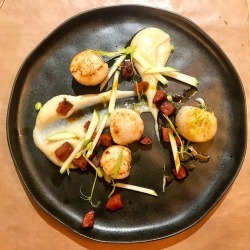 This brasserie is not your typical French Savoyard style restaurant. It is far more the chic, modern and bustling style brasserie with a good atmosphere. It has a large open area – with a sort of warehouse feel, lots of metal and glass – but trendy! with floor to ceiling windows around and an open kitchen to watch the chefs at work. The chairs and bar stools are very funky! 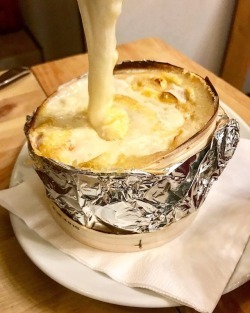 This restaurant is very conveniently situated in the Haute Savoie within walking distance of the Swiss border at Collonges sous Saleve and is attracting business people across the border for a better value lunch and the convenience of a large car park. The menu is not huge, which I personally like as this normally tells me that everything is freshly cooked, which is what the proprietor told us the first time we visited – on day 2, which was a Sunday lunchtime and it was full. During the week there is a plat du jour, but so far I have enjoyed the main courses from the menu. The food is well presented and the service is good. There is an attractive bar area with seating for snacks and coffee. This is a great place to take children as there is a children’s glass-enclosed play area with toys and a television. And the marvellous news they are open every day! 7/7 lunchtime and evenings.